(top) Commemorative painting by Richard Caton-Woodville. Reproduced by permission of the Honourary Colonel and Trustees of The London Scottish Regimental Trust. (bottom) Ordnance Survey, Belgium and Part of France. Courtesy McMaster University Library Research Collections. 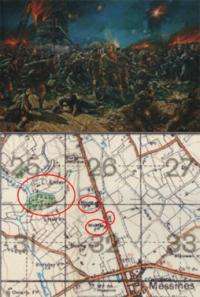 (PhysOrg.com) -- McMaster's collection of trench maps from the First World War is being put to work more than 90 years after the end of hostilities. On Hallowe'en night, 1914, Great Britain's London Scottish Regiment fought a major battle at Messines, Belgium in which they suffered heavy casualties. Though commemorated with an annual regimental dinner, magnificent painting and even a bagpipe tune, the location of the battle has until now been unknown. After discovering McMaster's Peace and War in the 20th Century web site, Pipe Major John Spoore, a 23 year London Scottish veteran, contacted staff at the Lloyd Reeds Map Collection at Mills Memorial Library for assistance in locating the windmill near which the battle was fought. "I do visit Messines very often, but the exact site of the mill has never to my knowledge been determined," wrote Spoore in an email to Collection staff, who he hoped could put his "old grey head at ease!" With a little help from the trench map collection, map specialist Gord Beck did just that. After familiarizing himself with the military history of the London Scottish Regiment with documents found in the Archives, Beck determined that the mill had been located between Huns Farm and Middle Farm, near the woods at L'Enfer. Using these clues, Beck scoured a trench map in the collection and finally located a very small symbol indicating a windmill, ending a near century-long mystery for both Spoore and the London Scottish Regiment. Since the addition of more than 900 First World War maps to the McMaster collection earlier this year, cases like this have become more and more common: staff receive about three requests for assistance every week, and there are untold numbers of history enthusiasts performing their own research at home, using the digitized maps found online. For his part, Beck says that he is more than happy to assist. "It's a fantastic way to explore the archives," said Beck. "You really begin to appreciate the richness of our collection." The Peace and War in the 20th Century web site can be accessed any time at pw20c.mcmaster.ca .